Want to be a Renegade? Enter to Win this Free Book! Posted by themidlifesecondwife in Special Events, The Reading Life, What's the Buzz? Be the Queen (or King) of all the social media you survey with this handy book. SPOILER ALERT: there are photos of—and tweets from—Shaquille O’Neal inside! The regular readers among you are aware that I attended the whopping big BlogHer12 conference in New York City last month. I’m still amazed by how many critically essential connections I made there, and by how much useful knowledge I gleaned. I’ll be writing a post soon, for example, about a wonderful new phenomenon known as the midlife blogger (Hey! That’s me!). 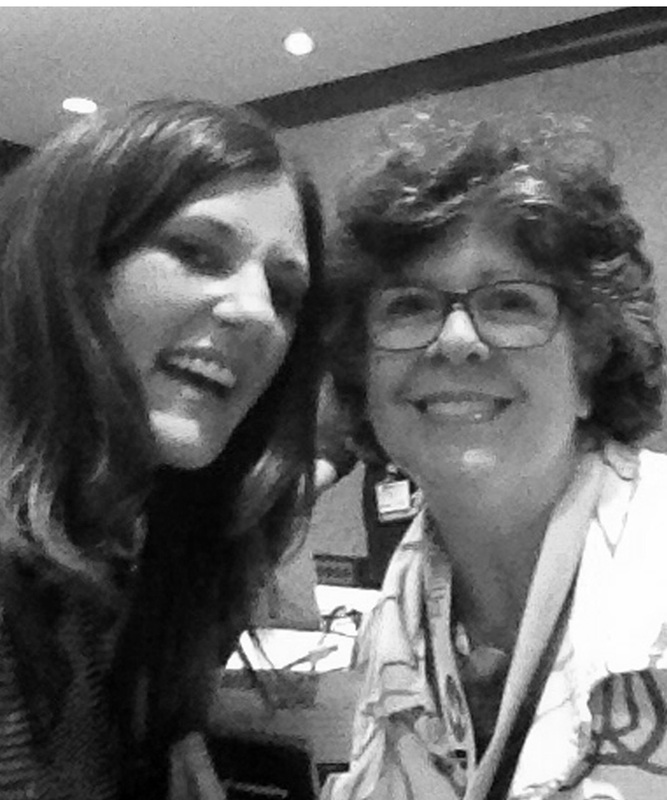 But today I want to tell you about an energetic, inspiring, and game-changing woman that I met at my very first BlogHer session, on Pathfinder Day. I was trying to find my path in this labyrinth of social media, and Amy Jo Martin is helping me do it. I had the pleasure of meeting the awesome Amy Jo Martin after her talk. 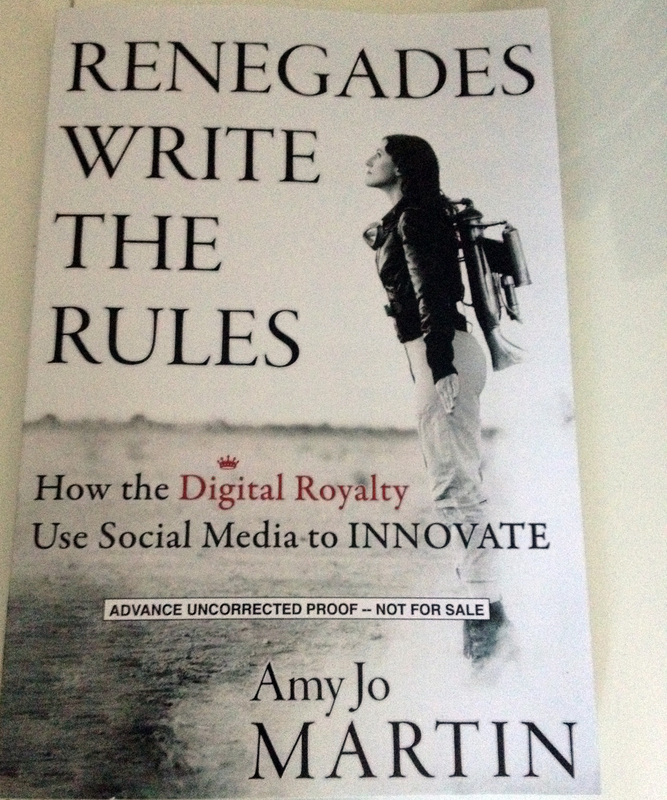 Amy Jo is the author of Renegades Write the Rules: How the Digital Royalty Use Social Media to Innovate. And with more than 1.2 million followers on Twitter, she knows whereof she writes and tweets. (Forbes Magazine named Amy Jo to its list of “Best-Branded Women on Twitter.) Because I learned so much from that BlogHer session with Amy Jo—and I’m learning so much by reading her book—I’d like to share that knowledge with you. This Friday, Sept. 28, I will choose, at random, a Facebook fan of the Midlife Second Wife. ** The lucky winner will receive an autographed copy of Renegades Write the Rules. If you’ve previously “liked” The Midlife Second Wife on Facebook, you’re already entered. But if you haven’t, and you’d love a chance to win this fascinating book, all you have to do is go to the blog’s page on Facebook and click “like.” I’ll announce the winner here and on Twitter, Facebook, and Pinterest, on Monday, Oct. 1, and I’ll tell you a bit more about the book. Now isn’t that a great way to start a new month? *Guess what I just learned? To be absolutely positively certain that my made-up agency is non-existent, I Googled it and lo and behold! I discovered that the FBI actually has an organization called iC3—the Internet Crime Complaint Center. You’ve now been warned. Remember Google’s original tagline: “Don’t be Evil.” And to paraphrase Amy Jo, perform “random acts of your own Shaqness.” This footnote has been brought to you as a public service of the Midlife Second Wife. You’re welcome. **Here’s how the drawing will work. I will print out my Facebook list of “likers” and create an entry card by painstakingly cutting each name into a separate bit of paper. I’ll then put all the bits of paper in a beautiful box, and ask the Midlife Second Husband to draw the winner. (I’ll have removed his name and mine from the pool in advance.) Although I can’t afford to have accountants from Price Waterhouse verify the results, I do hope to video the drawing with my iPhone and share it here. Well, here it is, the 13th day of the Digest Diet, and I seem to have plateaued a bit. 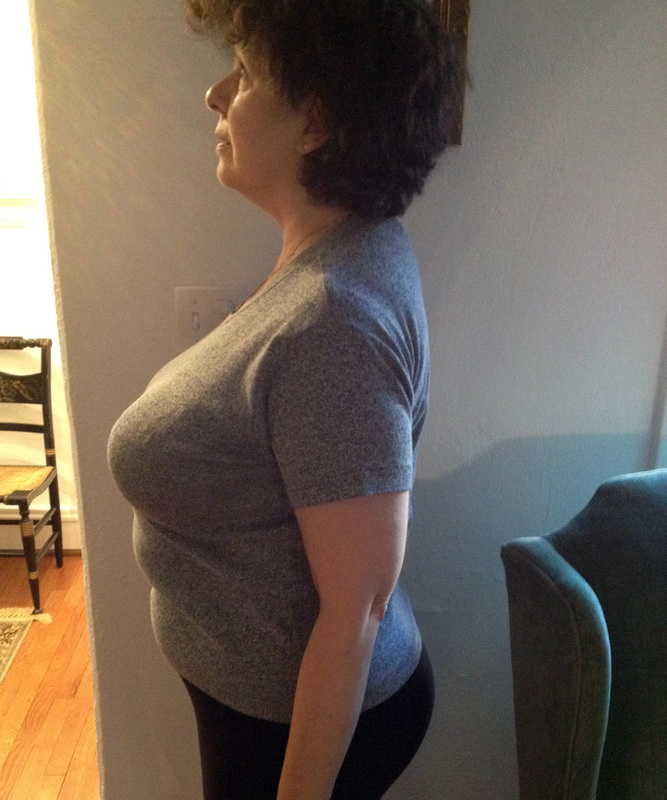 Don’t get me wrong: I’ve lost six-and-a-quarter pounds and for that I’m grateful. I’m still on the downward trajectory—and that’s better than the alternative—but I’m trying to determine why the weight loss has slowed. Several factors come to mind. First, last week a couple of events sort of knocked me off schedule. I didn’t eat any prohibited food, but I actually missed an afternoon snack and a dinner meal one day, compensating by having my afternoon snack in the evening. The practice of skipping a meal—or even a snack at this point—is one to avoid if at all possible. When you don’t eat, your body is tricked into thinking it’s in starvation mode and therefore clings to the fat for dear life. A paradox, but then so is the fact that women in France who eat butter- and cream-laden foods remain thin because they drink wine with nearly every meal. My resolve for the coming week: stay on track. During the first four days, the weight really came off—I lost three-and-a-quarter pounds by the end of this phase. I also enjoyed two delicious shakes each day and only one snack. I’m presently in the Fade Away phase, with only one shake per day and two snacks. The “Fade Away” phase is rather like a Mediterranean-style diet, with lots of green vegetables and protein, and it allows me a four-ounce glass of red wine at dinner (if I skip the wine I can have a handful of red grapes for dessert). I’m sure that diet results are as varied as people are, but I also wonder about something else. I’ve heard that muscle weighs more than fat. I’ve been walking fairly regularly, and this past week I did get up to two miles. My legs look and feel more toned, but is it possible that my weight loss isn’t quite as dramatic right now because I’m replacing fat with muscle? In an earlier post I stated my weight loss goal: to lose 15 pounds. I’m almost halfway there with eight days remaining in the program. I’m confident that I’ll make it, because even though I’m in something of a holding pattern, the meals on this diet are delicious enough, interesting enough, and filling enough, that I have no desire or intention to bail out. It’s time now to prepare my lunch—a “Fade Away” shake. Tomorrow will be the last day of shakes on the diet, and I have to say I’m going to miss them. I don’t miss pizza, but I know I’ll miss these shakes. Not missing pizza? That strikes me as another positive, and therefore another plus for the Digest Diet. 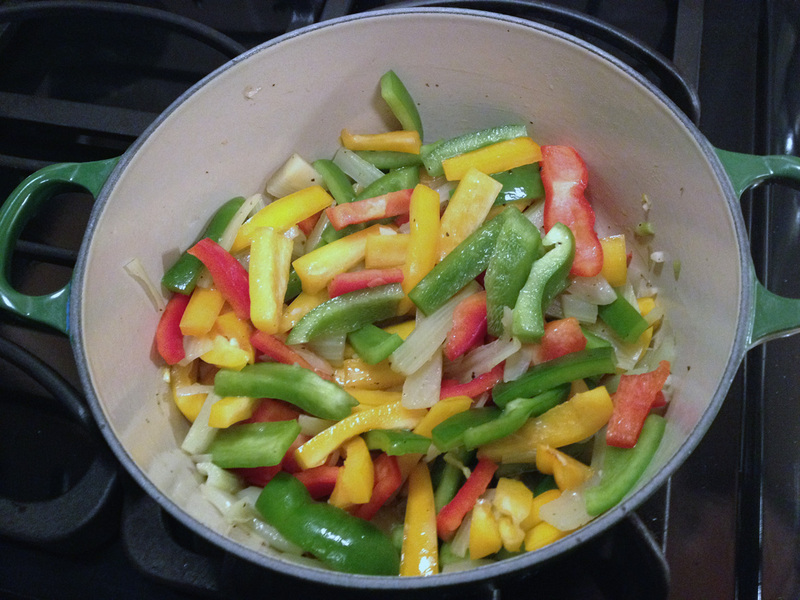 Bell peppers cut into short strips are sautéed with fennel and garlic in this delicious dish. I won’t leave you hanging. So far I’ve lost five-and-a-half pounds on the Digest Diet. This is amazing to me, not because I’ve never lost that much weight so early in a diet before, but because, with a few rare exceptions, I haven’t felt hungry or starved. 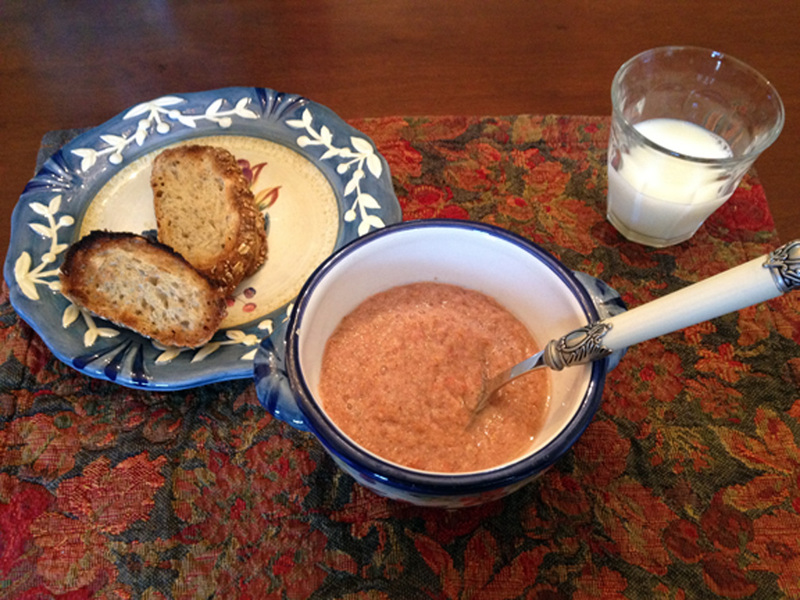 I’m eating well—good, wholesome, healthy food—and it’s mostly been delicious. I wasn’t wild about a snack of green pepper boats stuffed with low-fat Ricotta cheese and sprinkled with pepper, but then I’ve never been a fan of raw green pepper. I love Ricotta. I’m half-Sicilian, for goodness’ sake. 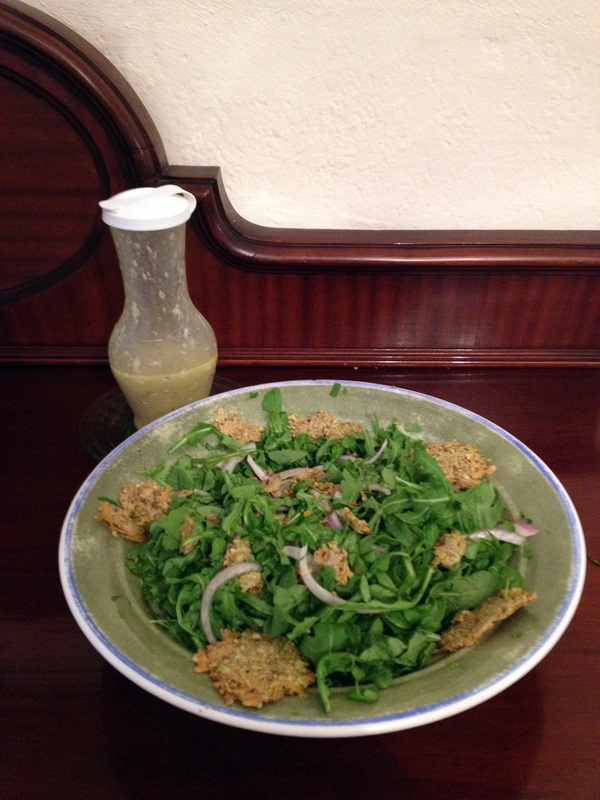 All of the meals I’ve prepared, using recipes from the Digest Diet book, have been superb. Take a look at this photograph, for example. Yes, those happen to be green peppers. They’re accompanied, however, by red and yellow bell peppers and sautéed in extra-virgin olive oil with fennel and garlic. Delicious. And what a wonderful feeling to use salt again. I always cook with Kosher salt, using sea salt as a finish when a recipe warrants. The recipe for Peperonata with Fennel called for a generous pinch of fine sea salt. I buy coarse-ground, but since I have a mortar and pestle I simply ground the salt to the desired consistency and keep it nearby for later use. I served this dish with a 4-ounce grilled boneless pork chop for Saturday’s dinner. And guess what? I enjoyed it with a 4-ounce glass of red wine—a robust Zinfandel. If this is what losing weight tastes like, well, I do believe I can keep this up for the full 21 days! The recipes in this book are delicious and fun to prepare. So this morning, after drinking a mug of hot lemon water (that’s not in the Digest Diet, but actually a regimen a good friend recommended years ago, when I was recovering from surgery for a broken leg), I walked a mile in my favorite park. I like to listen to French music when I walk. I wonder: if I continue to lose weight thanks to the Digest Diet and regular, brisk walks accompanied by the French chansons of Edith Piaf and Charles Trenet, do I have to count my weight loss in kilos? 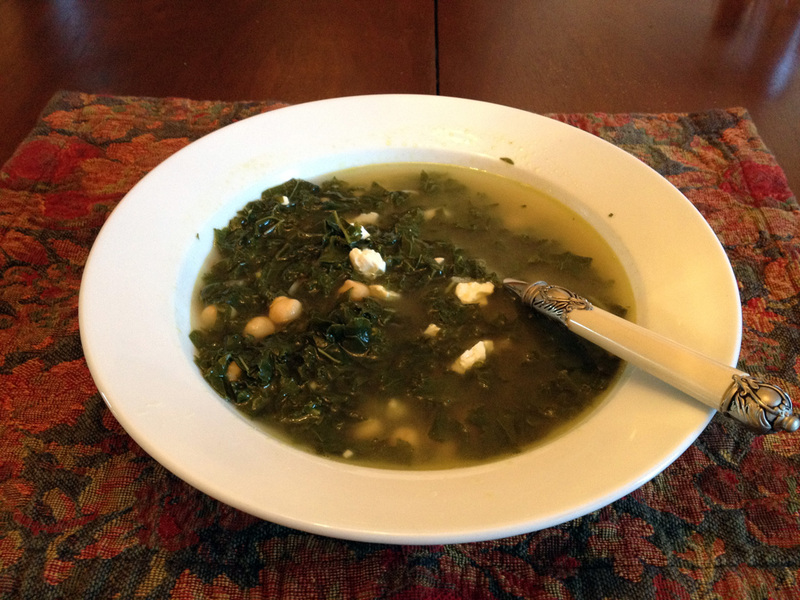 I made this delicious Kale and Chick Pea Soup for dinner on Day 1. John liked it, too! As I write this I’m into the third day of the Digest Diet. It’s nearly noon, I’m not even hungry yet, and I’ve lost two pounds. I’ve been dreading writing about the poundage issue. I’m the one who removes every bit of jewelry, eyeglasses, and shoes before getting on the scale in the doctor’s office. Yes, I shave a few of them off my driver’s license renewal application. I’ve never uttered the numbers aloud to anyone, really. But if I’m going to do this, and have any hope of inspiring you to a healthier lifestyle, I need to ‘fess up. The morning I started the diet, I weighed (closes eyes, takes a deep breath) 210 pounds. This picture, taken this morning, is my “before” picture. Note that I had already lost two pounds since Monday. In my defense, somewhere along the way I lost half-an-inch. I have no idea where it went. But this morning when I weighed myself, I had lost two pounds, so maybe the pounds and the half-inch are in that nether place where lost things go—socks in the dryer, pens and keys—hanging out and having a good laugh about what it was like to have once been part of me. I like to think I gave them a good time. Let me be clear: I’ve never had an eating disorder of any sort, unless having a gusto for gastronomy to go with my zest for life can be called a disorder. (It can’t. And it shouldn’t.) But I was always aware that I tended toward the upper regions of the scale. My first conscious memory of this was shopping for school clothes and being directed to the rack on which the 6-Xs hung. Still, I was never really what you would call obsessed with my weight. I liked my body well enough—and I appreciate it even more now, even when certain parts tend to make their presence known in the way of aching joints and lower back pain. And even when the inventory of my “parts list” has been diminished by numerous operations. No, my attempts at dieting were typically triggered by a special event or a special outfit. And they were always, until reaching life’s midpoint, successful. The best diet up until this one was something published in Glamour Magazine in 1974—”The Do and Don’t Diet.” I would love to find a copy of this somewhere. But here I am, trying this Digest Diet, and I have to say how impressed I am. The shakes are so filling that a couple of times I haven’t been able to finish them. They’re delicious, and so is the soup I made the other night. 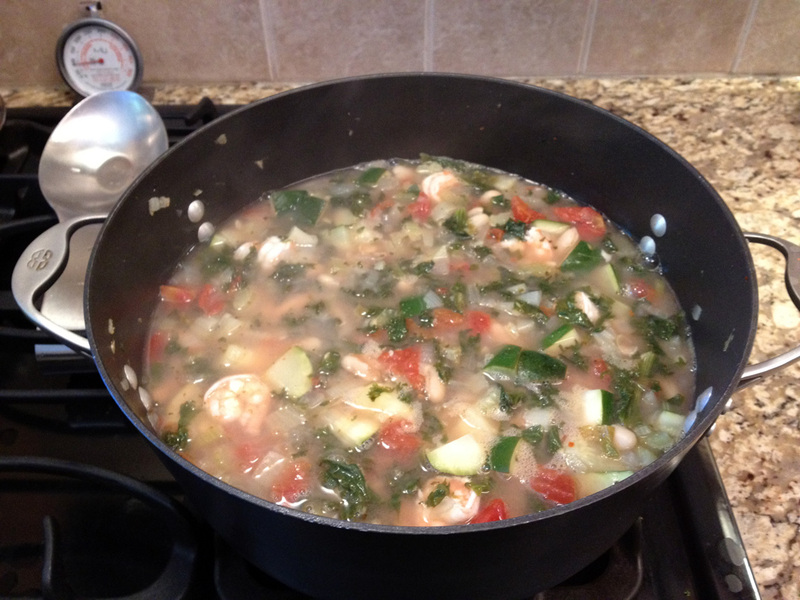 (Tonight I’m going to make a shrimp soup.) I’ve walked one mile each day for the last three days. With the exception of yesterday, when I slept in because I was plainly exhausted, I’ve felt energized. I recognize that what I’m doing is retraining myself how to eat. The book, written by Liz Vaccariello, explains the theoretical underpinnings of the recipes and food plans. Certain foods are fat releasers, others are fat retainers. The fact that all of this has already been figured out and tested, using current science, makes it pretty easy to follow. I measure ingredients, but I don’t have to weigh anything, count any calories, or keep track of points or carbohydrate grams. The premise that I love the best about this diet is that I’m eating whole, natural foods. I’ve been tempted by try those quick-fast meals and prepared shakes, but I’ve always feared the slippery slope of their preservatives and artificial ingredients. So what are my goals for this? My first goal is simple: to remain on it for the full 21 days without backsliding. My second goal is to lose 15 pounds. That will get me below 200, something I haven’t been for a very long time. Bound up with these goals are others, like feeling more energetic, reducing pain in my joints, and finding the motivation to exercise everyday. The fact that I can likely achieve these goals while improving my health is a tremendous bonus. I’ll have more to say about body image in a future post. But for now, I’d like to share with you an article that really touched a nerve with me. Tell me, has anyone ever made you feel bad about the way you looked? 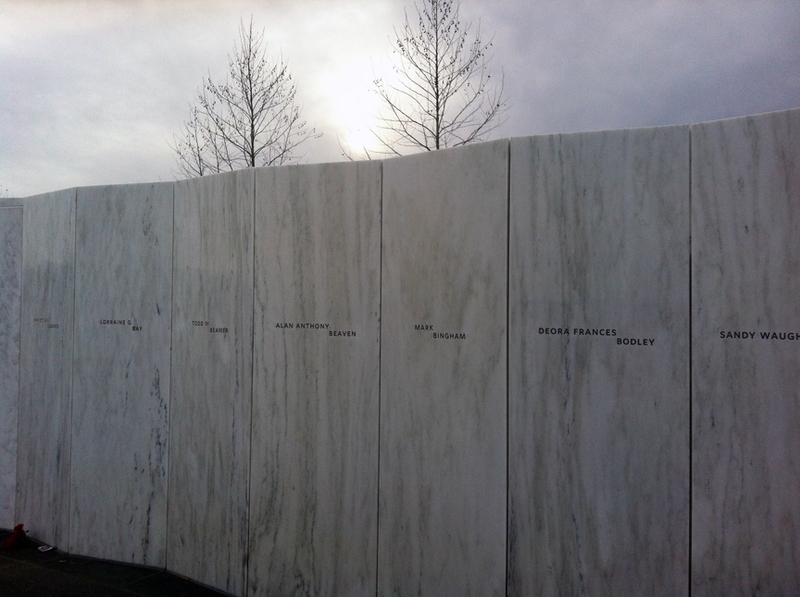 I took this photo last November at the Flight 93 Memorial in Shanksville, Pennsylvania. May the victims & heroes who lost their lives find eternal rest; may their loved ones find solace. Can you believe it? Powdered milk, for crying out loud. I’ve never bought powdered milk in my life yet here I am feeling like a bride-to-be who ended up with the short end of the veil at Filene’s Basement “Running of the Brides,” and all because I can’t buy more than one container of powdered milk. Quite a few people have written me, or shared comments on last week’s post, that they’re trying the diet, too. (Do y’all live in Virginia?) I feel as though I’m leading a small army into battle. And yes, you know I have to say it: It’s the Battle of the Bulge. 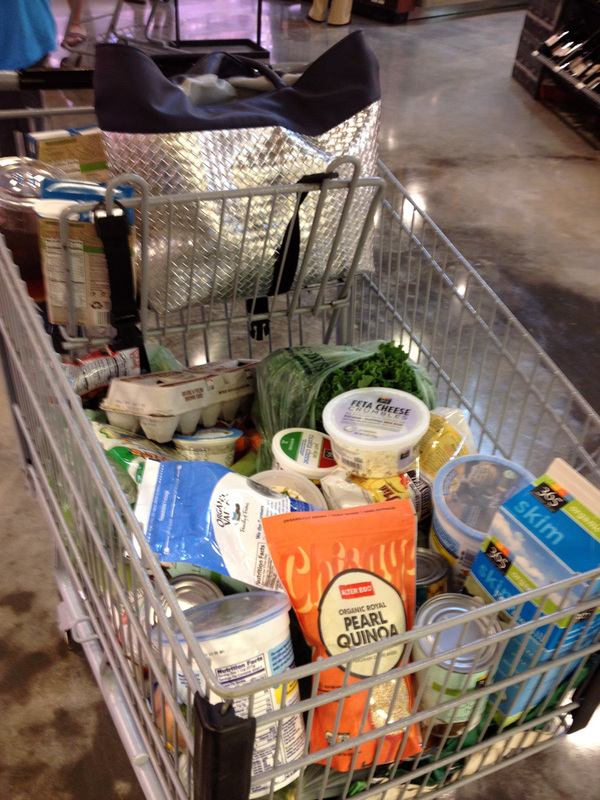 So here’s some of what I bought at Whole Foods. I also pinned the Digest Diet list on my Pinterest board, which I’m ever-so-slowly building. These are snacks, people. SNACKS. No candy, no chips, no nothin’ I’ve ever called a snack before. While we’re in the produce section, I’ll also mention that I bought zucchini, garlic, kale, and Swiss chard to make two amazing sounding soups I’ll be having for dinner the first four days. Plus strawberries for the shakes I mentioned earlier. Since I’ll be preparing my first shake this morning, after going for a one-mile walk, here’s the complete recipe as I’ll be making it. * (The key ingredients, yogurt, coconut milk, fruit/fiber, healthy fats, and honey, are considered “fat releasers.”) I’ll also have another shake for lunch. I might even kick up my heels and swap out the strawberries for a banana! FLAVORINGS (These are “optional” but I’m definitely adding both of them. And I’m pleased with the choices: 1 teaspoon unsweetened cocoa powder and/or 1/4 teaspoon ground cinnamon. *There are other variations on the theme—I could use banana, apple, red grapes, or mixed berries instead of strawberries. And one can choose among healthy fats—I love peanut butter, so that’s what I’ve opted for. I’ll send out a tweet later today to let you know if I loved this shake, or if it’s left me shaking my head. I’ll also be posting updates on Facebook. You can keep up with this great weight-loss adventure by following me on Twitter @midlife2wife or on the Facebook page for The Midlife Second Wife. See ya later! 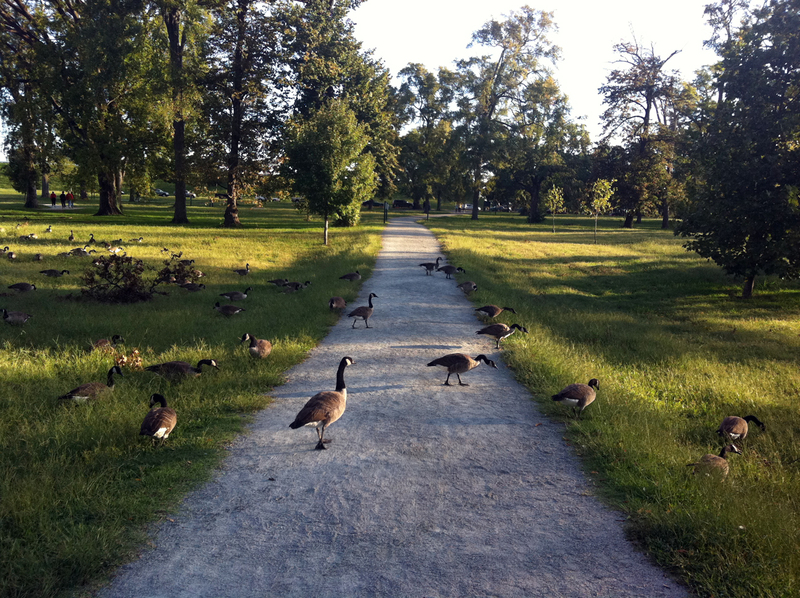 I’ve got a date with the walking path! Do you see this? This is a cookie. 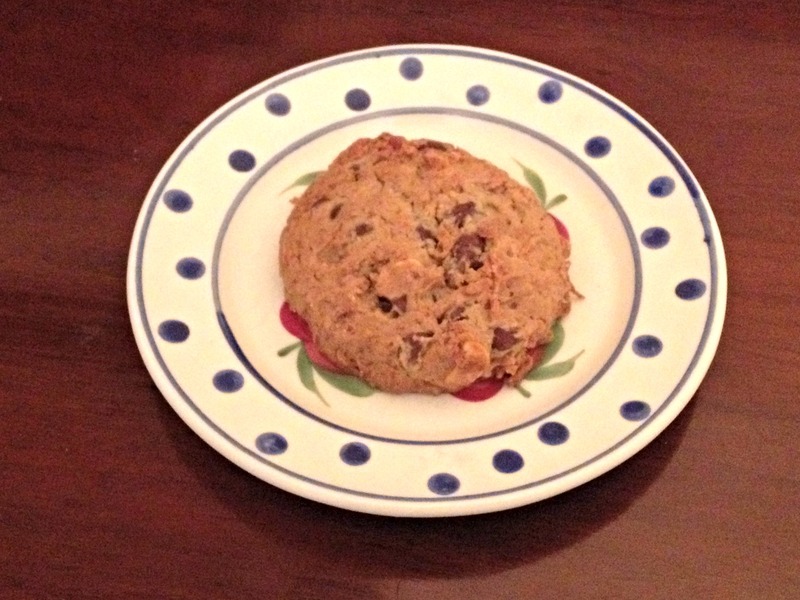 A rich, chocolate-coconut-walnut-laden cookie from one of my favorite lunch restaurants in Richmond, Café Caturra. Take a good, hard look at it. I’m certainly going to. Because if good intentions have anything to say about it, this cookie and I won’t be seeing each other for a long, long time. Sigh. It is a delicious cookie. I enjoyed every decadent crumb yesterday for my mid-afternoon snack. With coffee, of course. And then I promptly decided to join Team Digest Diet. Starting Monday, September 10, I will officially begin the Reader’s Digest’s “Blog it Off!” campaign. For 21 days, I will study this book, follow its guidelines, try its recipes, and—if there is a God—watch the pounds melt away. I’ll also blog about the process. In the interest of full disclosure, the kind folks at the Reader’s Digest suite gave me a copy of the diet book to try. (They probably saw me eating the cupcake.) And at my request they also sent me a copy of Best Loved Recipes, from whence the cupcake recipe came. But that’s it. There was no expectation on their part that I’d do anything with either book. This is something I want to do because, as I’ve already established, I need to lose some weight. And, as you already know, this blog is chock-a-block full of recipes, and I’m always on the lookout for more to share with you. Reader’s Digest is not paying me, either. Now that I’ve dispensed with that business, I will tell you that because I signed up for the challenge, I will be checking in with you a couple of times a week to let you know how my experiment with the book is going. 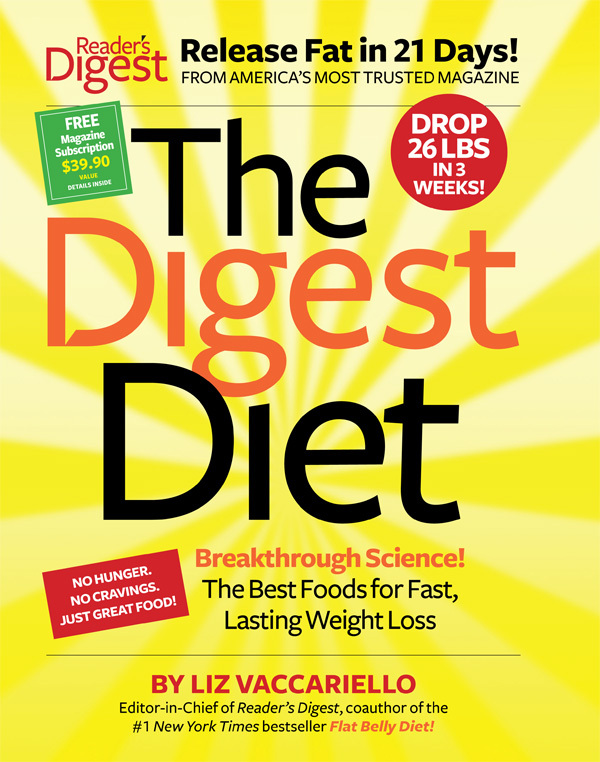 (I’ll share some of my favorite recipes from the Digest Diet, too.) And I’ll be tweeting and facebooking about it. You know, I’ve tried Weight Watchers before and enjoyed great results, largely, I suspect, because of the communal nature of the enterprise. But since I’m working from home (alone) and on the computer all day anyway (walking for exercise the exception), I view social media as just another way to supplement my efforts to lose weight. It’s kind of like keeping a food journal, but in a very public way. So there you have it. Starting Monday. That gives me the rest of today, Friday, and the weekend to gear myself up for the Digest Diet challenge and strengthen my resolve to leave the sweet treats and rich foods behind me for a while. After all, turnabout is fair play; they’ve certainly remained on my behind for a while.